We’ve established some rules to help assure the very best possible “TSP experience” for our attendees. Adding rules is something we would prefer not to do, but is essential whenever you bring hundreds of people together in one space for over a week. Your awareness of these rules will make a difference in helping things go smoothly for everyone. Please continue reading! The Texas Star Party is well-known for restricting activity and banning all lights after sundown. This provides a unique opportunity for you to become fully dark-adapted and remain so while observing under the dark skies. The Ranch will be dark from Sunday night through the final Saturday night, giving seven nights with no lights on the Ranch. The following rules will be strictly enforced. We hope everyone will cooperate so that we can guarantee “star party dark” skies to each observer. Vehicle headlights, parking lights, tail and brake lights, and interior dome lights must remain extinguished. All RV, trailer, and camper lights must be extinguished, unless proper shielding is installed on all windows and doors to prevent light escaping. This includes excessive lighting from the interior of open-ended observing trailers, which will require either dark curtains or facing away from observers. Coleman-type lanterns, campfires, grills, and outdoor lighting are NOT permitted at night. All flashlights must be equipped with red filters and should be pointed toward the ground at your feet. Red cellophane or fingernail polish is useful. Dim RED lighting for reading starmaps and equipment illumination is allowed. Laser pointers and any other form of lighting is not permitted during dark out, as these interfere with the observing/astrophotography by other attendees. In the event you must give off some light, give a yell! A precious photograph could be saved with a little warning. The lighting ban will be in effect when the sky is more than 10% clear. If it is raining, the ban will be lifted. If it is cloudy with the potential for clearing or there are some holes in the clouds, please keep white lights to a minimum to protect other people’s dark adaptation. Drive only if you must and use normal headlights. Exceptions to the ban may be provided to certain persons or vehicles only by consent of the TSP staff. Please understand that Ranch employees have business to conduct from time to time, but will keep driving to a minimum to avoid disturbance. You may be fined $50 or permanently banned from the Texas Star Party, if you drive a vehicle on the Prude Ranch when the Lighting Controls are in effect!! Driving in the dark is dangerous and can injure or kill people, damage telescopes and other property, none of which is yours to risk. Normal headlights are justified in true medical emergencies. For Late Arrivals and Non-Ranch Guests: The front gates of the Ranch are closed at 9:00 PM to restrict traffic and minimize disturbance to observers. DO NOT plan to arrive at night. Park your car outside the gates if you plan to leave during the night. Only telescope drive equipment, anti-dew gear, drive correctors, 6 watt or less bulbs, and 90 watt or less laptop computers may be connected to TSP power outlets. COMPUTERS (more than 90 Watts) and appliances such as hot-plates, coffee pots, fans, heaters, and refrigerators are NOT to be connected to TSP power outlets. Use LOW-HEAT setting on hair-dryers and avoid running yours when you hear another one being used nearby. TSP reserves the right to limit an observer’s total power usage to 1 Amp for all power cords serving your equipment in cases where there are too many users on TSP power circuits. You may also be required to relocate your setup or move your power connection to a less dense area. TSP reserves the right to disconnect your power cords to insert power measurement equipment. Power wires are not permitted inside sleeping tents/trailers/etc, except with approved medical-waiver tag or if located in a Prude Ranch RV site. If you have a power wire leading into your unattended (enclosed) observing tent/trailer/etc. you must disconnect from TSP power lines until you return the next day. Anything that remains connected (low-power chargers, etc) must be placed outside where TSP staff can see/access it (safety/consumption reasons). TSP reserves the right to disconnect and/or remove any power cord that is in violation or that appears to be a safety hazard. These rules do not apply to personal RV electric connections. “Full size” computer users should obtain an RV site or make arrangements with an RV site user. NOTE: Portable and RV electric generators will NOT be be allowed due to noise problems. Laptop computers/viewers (more than 90 watts) are not to be connected to TSP power cords. Display screens should be covered with red material or sufficiently shielded so light from them will not disturb neighboring observers. If you plan to operate your PC or viewer from inside your tent or trailer, install proper shielding to prevent light from escaping. Also see smoking rules below. Also see Dry-Camping Your Car, Truck, or RV. There will be no tents (sleeping or storage) allowed in the middle of the observing fields. On the Upper and Central fields, tents are permitted in marked areas of the field perimeters, but not blocking roadways/entrances. Approved areas for setting up tents on the Upper and Central fields will be marked. A road through the Upper field will also be marked. A map will be available at the Ranch Office. Do not leave cars parked on the observing fields, remove them as soon as you have loaded/unloaded. We want to maximize the amount of telescope space available, prevent tents from blocking the horizon for telescopes, and to limit the possibility of injuries caused by tripping on tent/awning support ropes and spikes. Use of Kendrick type tents and other “portable” observatories and “wind breaks”: Cannot be setup ON ANY FIELD where it blocks view of existing neighbor scope more than 30 degrees above horizon, without permission of neighbor. 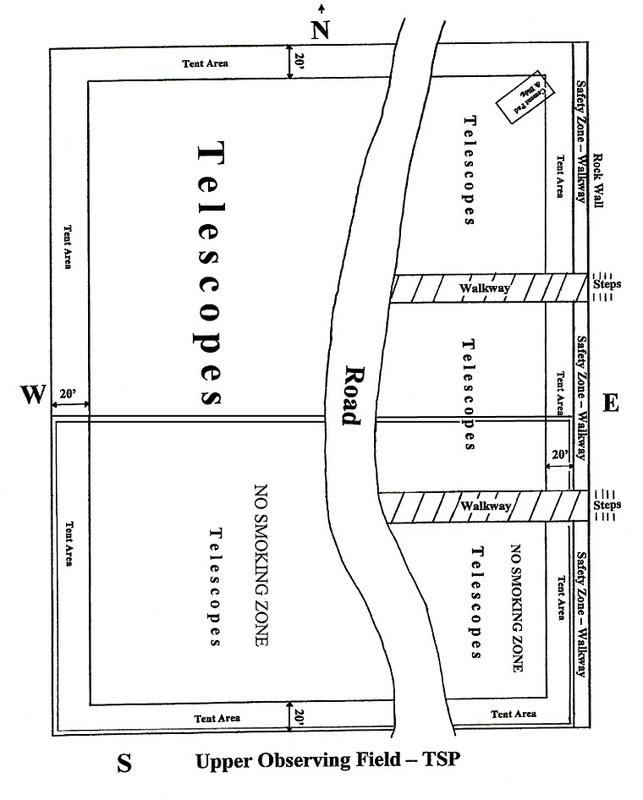 Upper and Central fields: Can be set up in observing area, but only along outer edge of observing area (no other scopes between you and the edge of field), except if you are with an observing group that is on the field edge. In fairness to other attendees, please do not stake-out spots in advance for your friends who have not yet arrived. 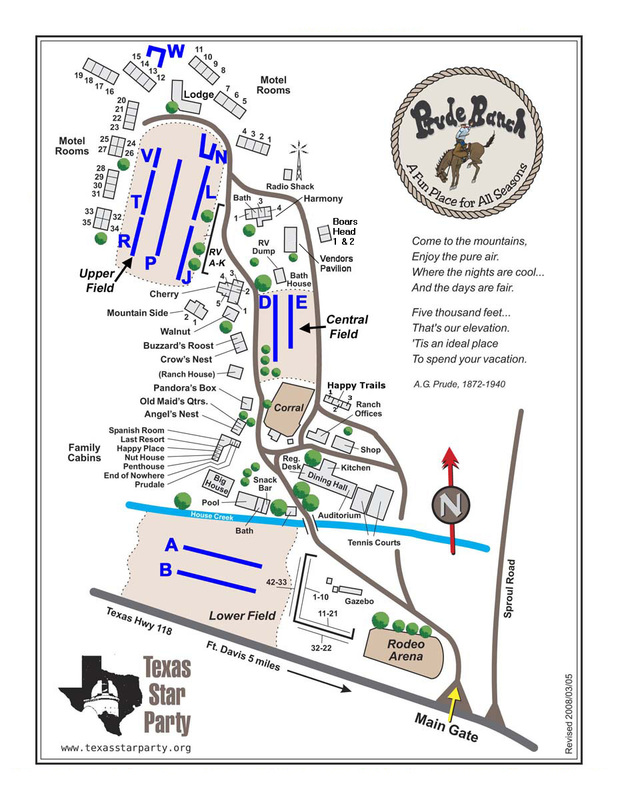 Map of the North (Upper) field, showing camping and setup guidelines. 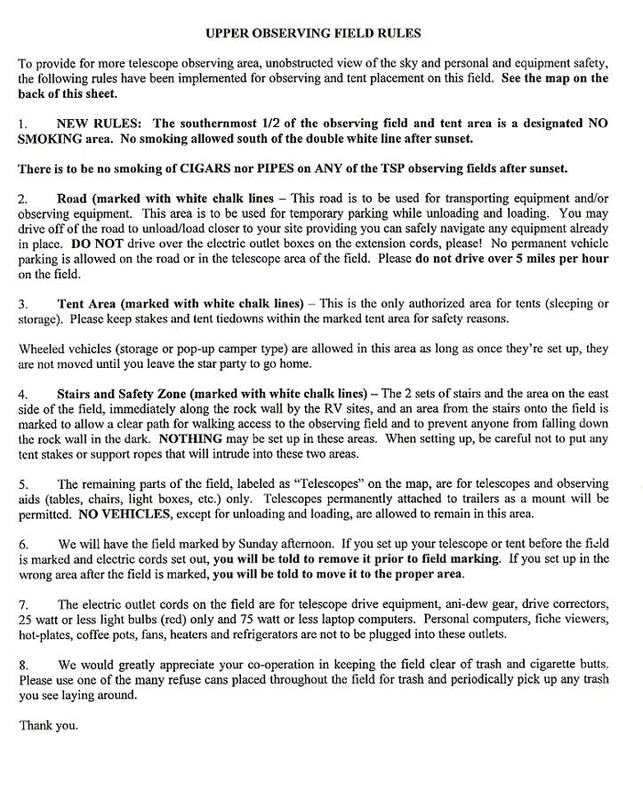 North (Upper) field Rules, if you decide to camp or observe here! Also see the Prude Ranch Internet page. TSP is no longer providing internet service in the observing fields, except that which occurs incidentally from nearby housing/public areas. Telescope-related Internet and Bluetooth devices are NO LONGER BANNED at nighttime! We are unable to support a high density of these devices in our area, with so many people. You should anticipate that the wireless internet capacity on the fields will be greatly reduced and your observing neighbors with similar devices will likely experience interference, contention, and other problems. Click Here for More Explanation. One possible solution is to use a wired-connection, such as the SkyWire Serial Accessory, which uses a direct wire to your telescope. Internet service is provided by Prude Ranch in other areas of the Ranch (not the observing fields) such as in/near the dining hall and meeting room, and near some housing/RV areas. There may be wired connections available at the TSP radio building. Do Not operate your own Wireless Router, Access Point, Range Extender, Wireless Print Server, Wireless Peer-to-Peer Network, Wireless Remote Control System or Bluetooth device during TSP. There are a limited number of open frequencies in the area and Prude Ranch uses all of them to deliver Internet access. Turning on your Wireless Router (or any device listed above) will slow response times for everyone else unnecessarily (due to radio switching) as the competing routers work out whose computer goes to what router. built-in or external wireless access adapter or card to connect to the TSP system as a client. USB or similar wireless access device that gives your computer wireless connection to the Prude Ranch wireless system as a client. Bluetooth devices use the same frequencies as the Prude Ranch wireless routers and can cause interference to users connecting with their network. Bluetooth devices include wireless headphones for cellphones, MP3 players and IPods, as well as some remote controllers for telescopes/focussers. NOT intended for intensive applications such as video, music, or Internet games, which demand high-bandwidth for GUI or data transfer. We reserve the right to disconnect your computer access and/or exclude offending wireless equipment from TSP for this or similar abuse, without notice. “Starwars” devices (lasers) are permitted (except during blackout), however you are not allowed to point them at other people. Shoot the sky or nearby mountains by pointing your device above the ground (away from people). While playing with cooperative friends is fine, there are usually innocent (and unhappy) bystanders that get blinded. Boisterous or loud/obnoxious behavior will not be permitted at TSP, especially during observing conditions, or late at night. Drunken behavior is grounds for immediate expulsion from the TSP event. Dogs are no longer permitted at TSP (except service dogs). This is due to persistent problems with barking, uncleaned messes (a problem in observing fields at night! ), as well as Ranch rules banning dogs in rooms and public buildings. Our check of the local vet ads includes: Fort Davis Veterinary Services at 432-426-3086. To fly any remote control craft (drone, plane, etc) over any TSP observing field, the owner must first obtain permission from TSP staff . Even if approved, you cannot fly during the TSP lighting ban. All craft must follow FAA Rules, if applicable. There is no smoking of cigars nor pipes on any of the TSP observing fields after sunset. On the upper (main north) observing field, the south 1/2 of the field will be a Smoke-Free Zone (marked by a double white chalk line). Non-smokers can appreciate cleaner air by setting up in this area. Please do not smoke in this area after sunset. The Ranch has also implemented a no-smoking policy for all buildings. If you smoke, please do so outside. Please clean up your cigarette butts from the ground and observing area around your telescope. Now that you know the rules … have fun!